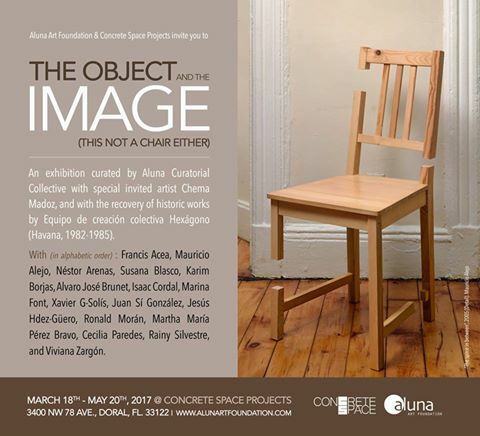 Aluna Art Foundation will participate in the inauguration of Concrete Space, an alternative art project that will open its doors to the public next Saturday, March 18th, with the exhibition “The Object and The Image (This is Not a Chair Either)”. Curated by Aluna Curatorial Collective (Adriana Herrera and Willy Castellanos), the exhibition will feature invited artist Chema Madoz, and will recover historic works by Hexágono: Equipo de Creación Colectiva(Havana, 1982-1985), integrated by Consuelo Castañeda, Humberto Castro, Sebastián Elizondo, Abigail García, María Elena Morera and Tonel. The exhibition will give place to a prompt dialog between local artists from different nationalities, and will feature works from (in alphabetical order): Francis Acea (Cuba/USA), Mauricio Alejo (Mexico), Néstor Arenas (Cuba/USA), Susana Blasco (Spain), Karim Borjas (Venezuela/France), Álvaro José Brunet (Cuba), Isaac Cordal (Spain), Marina Font (Argentina/USA), Xavier G-Solís (Spain), Juan Sí González (Cuba/USA), Jesús Hdez-Güero (Cuba), Ronald Morán (Salvador), Martha María Pérez Bravo (Cuba/Mexico), Cecilia Paredes (Peru/USA), Rainy Silvestre (Cuba/USA) and Viviana Zargón (Argentina). The Object and the Image (This Is Not a Chair Either), brings back the quest of a group of artists to exploit this subject. They work from different visions and approaches in the creation of a hybrid and highly polemic object – an alter object -, whose values move around the intersection of the constructive practices of installation, sculpture, and the documentation of an authorial experience, and whose final product is a photograph in itself. In this sense, the exhibition also exposes the artifact –the source of the exhibited photographs – uniting under one roof two instances traditionally separated in exhibition spaces: the image and its referent. This suitable coincidence will not only allow us a glimpse into the implicit mechanisms of image production, but will also propose to the spectator a journey through that zone that is neither the object nor its image: Rather, it is the mental process that transformed each artifact (in Latin “that which is made with art”) into a mine field that questions the stable condition of the “order of things,” and the concept of reality.